eCommerce Website Builders – Running your personal Web store isn’t only fun to do but when taken seriously can also earn you a nice supplemental income. Web stores are easily connected with a day job, and they can even become so successful that they replace your day job. e-commerce business owners have many choices when it comes to shopping carts or e-commerce platforms – almost all which demand to be easy to deploy and manage. In reality, however, most business owners wind up hiring a designer and a Web developer to create the perfect e-commerce site. Today, we’re here with the list of Top 10 best e-commerce website builders 2019 by which you can easily set up and manage your own Web store. There are many services out there for these new to web design. Those services help you design your website and increase its ranking in search engine results. Therefore, customers can find you. These include mobile website and web design for Mac. When you create your website, you will need a web hosting service and, if you run a business, you’ll also need online marketing tools to promote your website. VirtueMart, which has been designed to work alongside Joomla! is a really great cart which customers feel instantly comfy with. Not only does it let customers purchase issues, it lets them create an account, add addresses enter their order history. Multiple languages and currencies and unlimited products and categories are supported. Volusion is the one stop shop for selling anything online. This site has a complete online store developer which combine the options to build a website, create shopping carts for your clients and even have secure hosting services. They also offer business tools like payment processing, SSL certifications, domain names, an integrated live chat that will help you open communication lines with your clients, fraud protection that will protect your own business from deceitful orders and even extra packages that are available at a low price. X-Cart is a PHP e-commerce platform that gives free shopping cart software & solutions for high-performing online stores. Nowadays if you have a good design, you’ll surely get a good business. X-Cart has that extra touch of impressively designed templates which gives a superb look to your online store. The best thing about Zeuscart is its user interface, which is attractive, rich, user-friendly and generally less boring than most of the open-source UI that I have to look at on a daily basis. Easy to install, easy to customize and easy to manage, Zen Cart is perfect for those who want an easy e-commerce platform without the fuss. It comes with a newsletter manager, gift certificates, discount coupons, and all the basic features you’d expect. 1ShoppingCart is an all-in-one solution. It not only lets you create an online store but also to easily integrate its payment functionality into your regular website. Off all hosted shopping carts for small businesses, Yahoo has the highest market share in the top 10,000 and top 100,000 sites. This is actually quite impressive and has largely to do with the fact that Yahoo was one of the earliest to offer an online e-commerce solution. AmeriCommerce has all you needs to set up an e-Commerce store. With reliable hosting and user-friendly shopping cart, this platform helps the consumer to drive massive traffic to their site. There’s no better platform than WordPress for DIY sites, so it makes perfect sense to use WooCommerce, the WordPress-based e-commerce platform,” says Ben Lacey, head of marketing at Bluebird Global, who has built and run many small/DIY e-commerce sites. The core features of Shopify are to handle products, inventory, clients, orders, and reductions. A responsive checkout facility is the highlighting characteristic of this platform. With a rare design, Shopify converts guests into customers. You can also try your hand with the 14 day trial period to make yourself snug with this impressively managed E-Commerce platform. 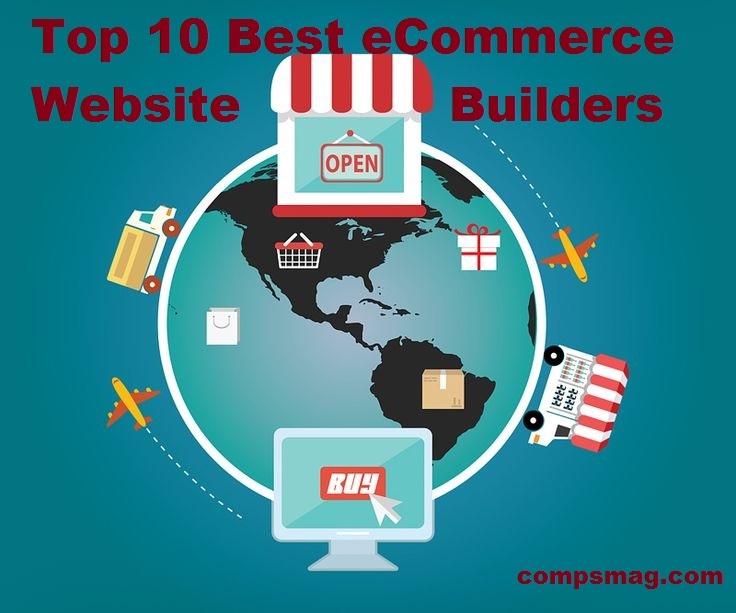 We hope you enjoyed the article ‘Top 10 Best e-commerce Website Builders 2019.’ If you have any other recommendation site? Tell us in the comment.